The problem with sunglass companies is that they’re just so darn excited to tell you about how great their products are. Generally, this is true; shades from high-end companies like Oakley, Smith, Maui Jim or Kaenon really are several cuts above the $12 ‘Fisherman Special‘ you probably have bought many times at gas stations. But when it comes to evaluating the relative quality of different pairs of sunglasses within a given company’s lineup, you’re pretty much left with just price. Price, and good old fashioned guess-and-check. So, when I first started wearing Costa Del Mar 580 lenses (instead of their older “400” moniker technology), I really had nothing to go on other than the fact that they were more expensive. 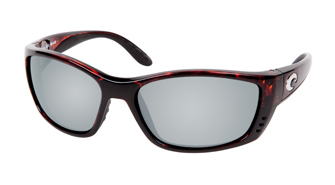 Costa 400 lenses come in both glass and polycarbonate, but the 580s only come in glass. Despite this, I don’t find them to be heavy at all (I prefer light frames, however–your mileage may vary). And I will say this: my 580s are, in fact, a cut above the 400s in quality, and have become my go-to sunglasses whenever I’m on the water. Costa says their 580 shades are the “most advanced glare-beating polarized sun lenses on the planet” thanks to “patented” technology that essentially blocks yellow light. They are named “580s” because the light spectrum at 580 nanometers is a yellow tone that humans find “particularly hard to process.” I’m not engineer enough to evaluate those claims beyond their face value, but I do know the 580s produce a noticeably sharper image, with higher contrast between bright and dark spots, and better overall clarity. What’s more, the glass 580s are holding up better than the softer polycarbonate 400s did, based on my unscientific testing (that is, when I forget that I’ve taken the strap thingie off and fling my shades to the ground with gusto, which happens about once a month). What Costa calls its “Silver Mirror” flavor, I would dub a more mundane ‘ocher’ or perhaps ‘brick rose.’ Speaking as a photographer, the magenta, green and and blue tones are elevated while the yellows and browns are washed out. (My lawn looks amazing in 580-vision.) Last year’s “Fathom” models fit my face better than the new “Fisch” design, but for those of you with wider temples, the Fischs would be the way to go. 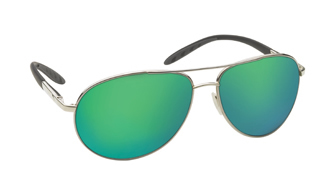 I was particularly excited to see the Aviator-esque “Wingmans” offered with 580 lenses this year, and I plan to get my Hunter Thompson on as soon as the moustache comes in. What’s your favorite high-end sunglass brand and why? Let us know in the Comments section!